I hope you are enjoying the beautiful fall day! It’s challenge day at The House that Stamps Built, and we have a great Designer’s Choice Challenge for you. RI Rock Star, Karen, is hosting and has a wonderful theme challenge for us. Please join in our challenge, and create something using the theme "Focus on the Sentiment". along with my wonderful Repeat Impressions sentiment. Voila! We hope you will create a card that has a focus on the sentiment, and enter it in our challenge at The House that Stamps Built! Remember, your creation does not have to be made with Repeat Impressions stamps, but if you would like to include our designs we would love to see them! Plus, there’s an added bonus… you will get an additional entry in our random.org drawing for using our stamps in your submissions! Lovely card Patti! Love the pretty blue, die cuts, bling, and sentiment. Beautifully done. Those die cut layers really do bring the focus on the wonderful sentiment too! Looks like several of us are feeling the need to get ready for Christmas. : ) Your card is so pretty! Love the colors and those frames really show of your sentiment so well. Love your simple design, Patti. We all need ideas like this for some quick, but eye-catching, Christmas cards. 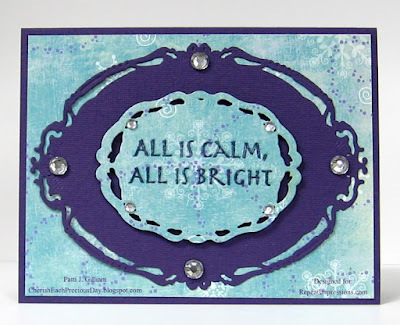 Beautiful card, like how you stamped on the patterned paper and your bling! Love your colour combination and how you just used a sentiment on its own. Great work once again.